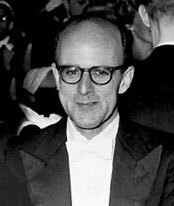 B' e ceimigear às an Ostair a bha ann am Max Ferdinand Perutz (Vienna 19 an Cèitean 1914–Cambridge 6 an Gearran 2002). Bhuannaich e an Duais Nobel ann an Ceimigeachd ann an 1962 còmhla ri John Kendrew airson na h-obrach aca air structaran nam pròtain cruinneach.. A bharrachd air sin, 's e an t-ochdamh Iùdhach a choisinn an Duais Nobel ann an Ceimigeachd a-riamh a bh'ann. ↑ “The Nobel Prize in Chemistry 1962”. Nobel Media AB. Air a thogail 25mh dhen Mhàrt 2018. Air a tharraing à "https://gd.wikipedia.org/w/index.php?title=Max_Perutz&oldid=541490"
Chaidh an duilleag seo a dheasachadh 25 dhen Mhàrt 2018 aig 11:46 turas mu dheireadh.